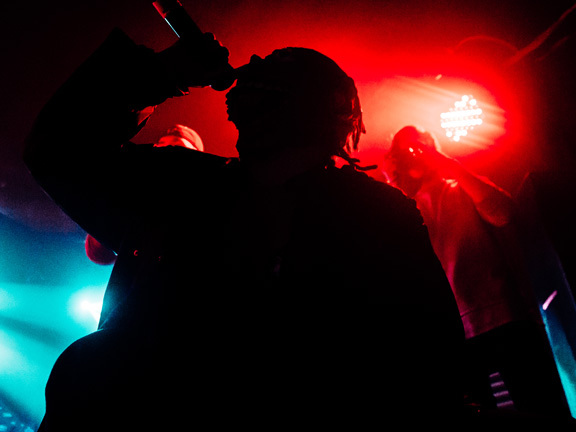 Houston Karaoke is a leading provider of Disc Jockey and Karaoke entertainment, based in Sugar Land we serve all of Houston and Southeast Texas. Established in 1974, it was only natural for equipment rentals to become an extension of the services we offer. 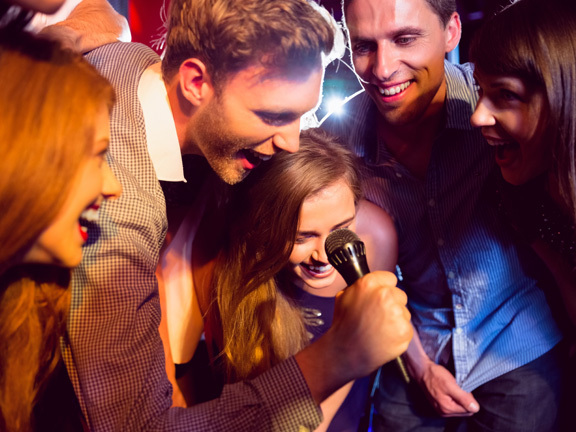 We are proud to be America’s Largest Karaoke Rental Company! 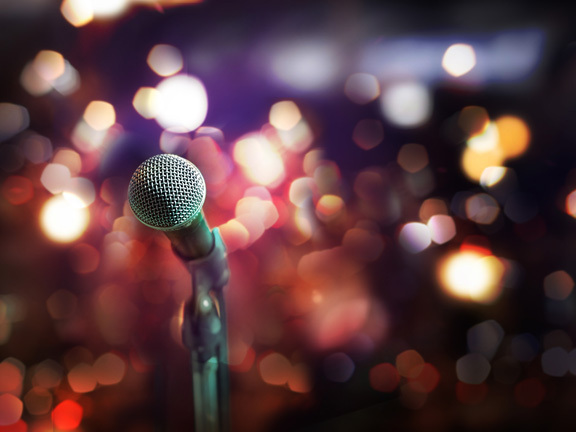 Houston Karaoke only uses professional band equipment to produce the highest quality sound with the largest Digital libraries. Others offer cheaper “boom boxes”, less dependable equipment and smaller libraries that have missing disc’s or disc’s that skip, please compare, keep quality in mind and remember “the bitterness of poor quality is long remembered after the sweetness of low price”. Many times customers ask “what is the difference between one system and another”? This is easy to answer, quality of sound from larger speakers and power of the amplifiers, our larger systems produce the best sound. This is our best professional karaoke package is suited for any stage show or party (we use this system ourselves). Laptop computer with over 25,000 songs to chose from, Two catalogs listing all songs (more if needed), Mackie DFX6 mixer with 3 Wireless Handheld microphones, 19″ LCD Monitor w/stand, all cables, two Mackie 15″ Powered speakers 1000watt Output w/stands. “This system raises the quality bar of karaoke rentals”. 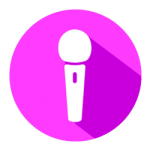 This professional karaoke package is suited for any stage show or party. Laptop computer with over 25,000 songs to chose from, Mackie DFX6 mixer with 3+1 Wired Handheld microphones, 19″ LCD Monitor w/stand, all cables, two Mackie 15″ Powered speakers 500watt Output w/stands. “Our most popular system”. Contact us today and we will assist you with your karaoke party needs. Call 281-980-8911 or email us at: info@houstonkaraoke.com. Enjoy all digital sound produced from Laptop computer with over 25,000 songs to chose from. 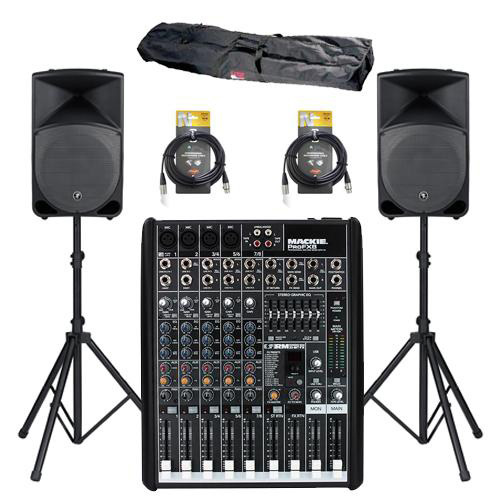 Powerful 100W mixer with 2 +1 microphones, two 12″ Full Range speakers’ w/stands, 19″ LCD Monitor w/stand, all cables, This system is just right for party’s of less than 30 to 50 guests. Give us a call today to schedule your rental: 281-980-8911. Our team is ready and willing to help you. We now offer professional DJ sound systems which include all the equipment needed to entertain at your event. 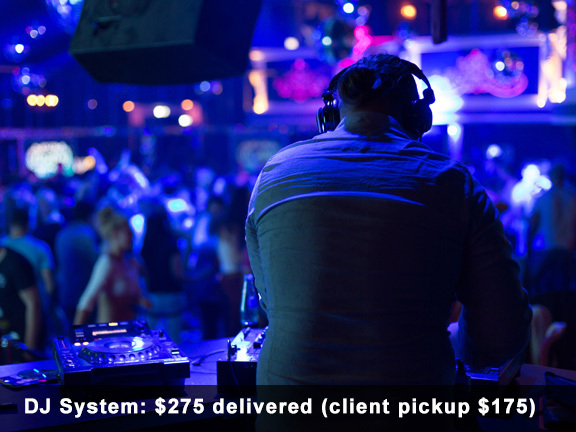 These systems include a dual deck CD player, mixer, microphone, 2 15″ speakers with stands, and a powerful amplifier. All enclosed in professional road cases. Great for entertaining or as a powerful PA system, we even include the cables needed to connect your IPod or computer! Let our professionals host your event and we will motivate your guest to ensure that your event is everything that you planned. Contact our rental, event coordinators today. Our team is ready and willing to help you. MORE AUDIO VISUAL RENTALS- CLICK HERE!